The Vietnam National Statistics Office announced this week that the country's inflation rate shot up to 25.2 percent in May (when compared with same month last year). Prices increased by an estimated 3.91 percent between April and May alone, a period that saw panic shopping for rice as prices surged. This was the highest month-to-month rise since 1995 according to Statistics Office. As can be seen from the chart below the surge in Vietnamese inflation over the last six months has been really quite dramatic. Inflation is - in a growing number of countries - the problem of the hour, and only this week the credit rating agency Fitch warned that accelerating inflation threatens the credit ratings of a number of emerging market nations. Fitch Ratings specifically singled out Jamaica, Ukraine and Kazakhstan as the most vulnerable, but they could just have easily have mentioned Latvia, Bulgaria, Lithuania or...... Vietnam, they are, after all on the list. Fitch has constructed an index of relative EM vulnerability to inflation shocks based on inflation dynamics, the degree of domestic overheating, monetary conditions and the importance of the domestic government debt market to the sovereign. The top ten most vulnerable EMs according to this index are currently: Jamaica (1), Ukraine (2), Kazakhstan (3), Bulgaria (4), Suriname (5), Latvia (6), Lithuania (7), Ghana (8), Vietnam (9) and Sri Lanka (10). Prices in the food category which includes rice jumped 67.8 percent in May from a year earlier and 22.2 percent from April. Prices in the broader food category rose 42.4 percent from a year ago. Rice prices are being driven by energy and fertilizer prices, as well as by increased costs of processing equipment and transport, Bui The Giang, deputy permanent Vietnamese representative at the United Nations, told a special UN meeting called last week to address the global food prices issue. But it is not only food and energy prices which are rising rapidly, prices for housing and construction materials jumped 23 percent from a year ago (and 1.2 percent month-on-month), while transportation climbed 15.5 percent year-on-year, while prices for clothes and footwear were up 9.5 percent, pharmaceuticals and health care increased by 8.2 percent, and the cost of household goods and appliances rose by 7.5 percent. So this is the first point I would like to focus on: not everything is going up at anything like the same price, and we can really identify two broad catagories which are heading the inflation charge in Vietnam, food and energy, and housing and construction. The first of these categories may well be seen as an indicator for developments in global prices, while the second could well be thought of as a proxy for domestic demand driven overheating. And it is this second factor which marks out the difference between countries like Vietnam (or Ukraine) and others like India or Brazil, where inflation, despite rapid economic growth, is much, much lower. What we need to think about is why we have this difference at this point. India after all eats a good deal of rice, and is dependent on importing a good part of its energy needs. Yet while India's inflation is a problem and was above the central bank's target for a third straight month at the start of May it is not Vietnam - and wholesale prices rose a serious (but not at this point disastrous) 7.82 percent in the week ended May 10 from a year earlier, after gaining 7.83 percent in the previous week. 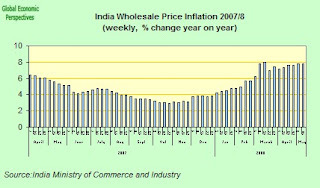 In fact it is quite likely that Indian inflation is rather higher than this figure suggests as the government revises the preliminary wholesale-price estimate two months after the initial release on receipt of additional data, and of late all the revisions have been upwards, and in the 1 to 1.5% range, so a more accurate estimate of India's current inflation rate may be something like 9%, worrying enough, but thankfully a far cry at this point from what is happening in Vietnam. The central bank in both countries has been trying to use monetary policy to contain the situation, even if in neither case have they been sufficiently forceful to satisfy the critics. The State Bank of Vietnam decided on May 17 to increase its base rate pretty substantially to 12 percent from 8.75 percent and as a result Vietnam's commercial banks raised the rates they offer depositors to as much as 14.8 percent. The Reserve Bank of India had been raising interest rates to contain inflation, but after the growth rate started to slip as exports weakened following the rise in the value of the rupee that accompanied the monetary tightening, and the inward surge of foreign capital they started to desist from further increases, and at their last meeting on April 29 they kept the benchmark repurchase rate, or the overnight lending rate, at 7.75 percent. Instead they are attempting to force bankers to increase reserves, and twice in the last month they have asked lenders to set aside more funds, raising the so-called cash reserve ratio to 8.25 percent, the highest since March 2001, from 7.5 percent. One obvious area where the difference between India and Vietnam is very clear is in the attitude their administrations adopt towards movements in the value of their national currencies. 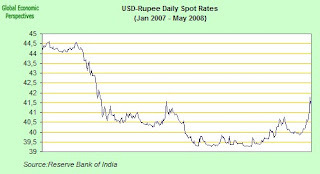 The rupee has fallen back somewhat against the dollar this year, but in 2007 it was up against the greenback by something like 12%. The Vietnamese dong on the other hand has been maintained within a very tightly set trading band, although the band has this week been widened by the State Bank of Vietnam and it will now be allowed to rise or fall 2 percent from its daily rate against the dollar. The band was last widened in March when the central bank increased it to 1 percent from 0.75 percent. This move was taken by the bank after a jump in demand for dollars widened the gap between the official value of the currency and the so-called free-market rate. ``The demand for U.S. dollars is accelerating,'' Nguyen Quang Huy, director of the banking-management department, said in a statement on the bank's Web site late today. 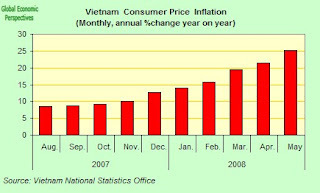 The increase was caused by Vietnam's highest inflation since 1992, Huy said. So it seems market forces - far from producing an appreciation in the dong - may well lead to its decline, as inflation drives more and more Vietnamese citizens to hold what money they have in dollars as a form of security as inflation rapidly corrodes the value of the domestic currency. The State Bank of Vietnam today moved in and set the daily reference rate for the dong at 16,060 to the dollar but the free-market rate, which is used by money changers, was running 17,500 to the dollar according to the newspaper Thoi Bao Kinh Te Viet Nam. The ``high demand from certain people for dollars is the main cause of the rising rate in the free market,'' Huy said in the statement, which was released in a question-and-answer format. Still, the scale of the free-market was small and wouldn't disrupt the financial, monetary and business operations of the economy, Huy said. Given the inflation rate, the recent weakening of the Vietnamese dong - which had previously been strengthening against the U.S. dollar has to be a bad sign. Matthews wrote. The present street value of 17,500 to the dollar compares with the currency's strongest level this year set on March 21, when it touched 15,810. 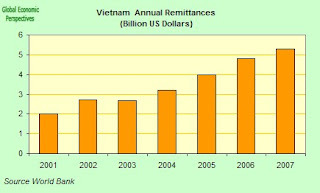 Vietnam had about $13.4 billion in dollar bank deposits as of July 2007, or 24 percent of the total and this percentage had been falling steadily from around 44 percent in 2001. Vietnam is the most dollarized economy in Asia, and the de-dollarization of Vietnamese savings had been quite an important policy objective for the Vietnamese authorities. Given the relatively small size of Vietnam’s economy, a marginal shift of major institutional investors into Vietnam could give rise to difficult policy dilemmas. A massive increase in the scale of intervention could be more difficult to sterilize, thus fueling a continuing increase in credit growth and rising inflation. Alternatively, the adoption of a more flexible exchange rate policy could result in considerable upward pressure on the dong. Given that the real effective exchange rate currently seems to be in line with fundamentals, a large appreciation of the dong in the context of a widening current account deficit could make it difficult for vulnerable sectors to maintain their competitiveness, and could eventually threaten external stability. Moreover, expectations of currency appreciation could encourage inflows of short-term speculative capital, while discouraging some inflows by longer-term investors, thus making the balance of payments more vulnerable to changes in market sentiment. Vietnam's economic growth rate slowed in the first quarter of this year according to government estimates, as industrial and construction output were hurt by rising prices amid the galloping inflation. Gross domestic product expanded 7.4 percent through March from the same period a year earlier, compared with a revised 7.8 percent rate in the first quarter of 2007, according to figures from the General Statistics Office in Hanoi. Vietnam's economy grew 8.5 percent last year, the fastest pace since 1996. Growth in the industry and construction category was 8.2 percent, down from 9.1 percent in the same period a year earlier, according to the report. Growth in the category measuring construction alone was down to 3.3 percent. Analysts are suggesting that the price of building materials has been having a "serious impact" on construction projects, with some contractors refusing to sign contracts after winning bids while other projects have come to a standstill, according to a Vietnam Investment Review report back in March. Industry and construction accounted for 42 percent of Vietnam's economy in the first quarter, the Statistics Office said. Growth in Vietnam's services industry, which accounted for 44 percent, was 8.1 percent in the first quarter, little changed from a year earlier. The hotel and restaurant trade grew 12.2 percent, as the government reported a 16 percent increase in visitor arrivals, paced by a 58 percent surge in business-related visits. Agriculture, forestry and fisheries, which accounted for 14 percent of Vietnam's economy in the first quarter, grew at a 2.9 percent pace, up from 2.6 percent in the same period in 2007. So, if the problem isn't simply one of not letting the currency apreciate fast enough, just why is inflation so high, and getting so rapidly out of control in Vietnam? Is it conceivable, for example, that Vietnam's somewhat higher rate of inflation may simply be a benign manifestation of the structural changes underway in a rapidly developing economy. One possible interpretation along the above lines would be that Vietnam's inflation is a side-effect of an adjustment in relative prices of the sort that could be considered to be appropriate when large productivity gains in tradable sectors trigger wage increases, which spill over into the rest of the economy. Economists call this type of adjustment the Balassa-Samuelson effect. If this was the case, inflation could be viewed as a temporary effect of a move towards a new market equilibrium and, as such, it should be no cause for concern. But where is the evidence to back this view? As I say above, the main pressures on Vietnamese wages and prices are either coming from global factors, or via demand overheating and the impact of this on materials and labour prices in the construction industry. If there is any impact on wages in the tradeables sector the direction of the arrow may well be the inverse of the one anticipated in the Balassa-Samuelson effect, as labour shortages and increased wages in the non-tradeable sector spill over into the tradeable one. In an earlier inflation "episode" back in 2005, IMF staff economist carried out empirical analysis which suggested that overheating in the economy probably played a considerable role. The 2005 inflation spike coincided with an increase of the output gap, which is measured by the difference between actual output and estimated potential output and is widely used as an indicator of excess demand. Their econometric work also revealed an inertia component in Vietnam's inflation that was higher the one found in the other countries in the region. This suggests that once inflationary expectations become entrenched in Vietnam, as they surely are now, then it is much more difficult to bring inflation back under control. This higher inertia may be rooted in public memory of an earlier epoch of high inflation that lasted until the early 1990s. So the possibility may well be that Vietnam (and other emerging economies which are experiencing similar dramatic inflation spikes) are experiencing "capacity problems", that is they may well be trying to grow faster than their resource base can easily allow. As can been seen in the chart below, Vietnam has indeed enjoyed very rapid economic growth in recent years, especially when measured in US dollar terms, and this economic growth has both raised living standards and expectations, while at the same time reducing productive land available for agricultural exploitation (and especially rice cultivation) as well as drawing large numbers of Vietnam's previously underemployed rural workers towards the urban areas. As I argue at some length in this post, the issue of rice prices (and indeed of the whole structural rise in food and energy prices) is a complex one, and a lot of seperate factors come into play. Land use is simply one of these: Vietnam’s total paddy acreage has dropped from 4.3m hectares to 4m hectares in recent years, and part of the reason for this has been increasing pressure on land use from other areas like industrial development and housing. Of course, raising output is not incompatible with using less land, providing productivity rises fast enough, but this (as we will see later) is not always as easy as it sounds on paper. 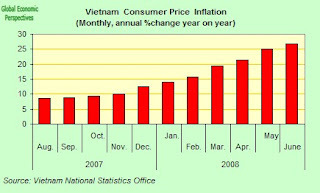 A second factor which is also important is inflation - and again as we will see, Vietnam is now suffering from a fierce bout of inflation - since rapid rises in the prices of some basic commodities can lead to hoarding in the expectation of future price increases, and the only way to halt this is to convince people that prices will stabilise, something which in the present climate is very hard to do indeed. 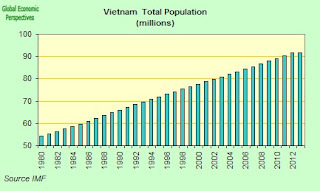 Basically a combination of rapidly rising living standards and an increase in inventories for "hoarding" purposes can provide us with a large part of the explanation for why it is that despite the fact that Vietnam has now ceased to export rice the queues to be found in Ho Chi Minh city are currently longer than anything which has been seen since the height of the communist era. But things are not, as we have been seeing (in, for example, this accompanying post on the roots of the problem) as simple as we - or classical economic theory - might like them to be, since many things are interconnected here, and in fact far from being able to simply breeze that extra mile that James Adams (World Bank Vice President for East Asia Pacific) is rooting so hard for and increasing land under cultivation, Vietnamese farmers are currently losing thousands of dollars every year as a result of manpower and machinery shortages when it comes to harvesting the rice they would evidently like to grow. Provinces in the Mekong Delta region continue to suffer from a lack of workers to harvest crops, as young potential workers are attracted to work in the rather better paid jobs which can be found in the urban areas. 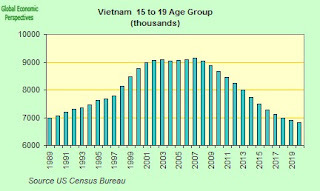 At least this is the situation described in a recent survey carried out by Can Tho University, and the problem has now started to become an acute one since - owing to Vietnam's spectacular recent growth (see above chart) - potential young farmerworkers are leaving in droves for urban centres, industrial parks, export processing zones or points farther afield (external migration), in search of jobs which offer better pay, and given the collapse in Vietnamese fertility which has taken place since the late 1980s, there are now, in a fashion which is eerily similar to the pattern we have already been noting in China, fewer and fewer young workers about to enter the Vietnamese rural labour market, creating a potentially huge long term labour gap in areas like the Cuu Long (Mekong) Delta (Viet Nam’s biggest breadbasket). For Vietnamese farmers, the sharp rise in rice prices comes amid rapid change in the rural landscape. Vietnamese rice farmers today are far more productive, and prosperous, than they were during the ill-fated, and long abandoned, drive to collectivise agriculture. But in the new drive for nationalisation, much prime paddy land is being converted to factories and housing. According to Hanoi’s Institute of Policy and Strategy for Agriculture and Rural Development, Vietnam’s total paddy acreage has dropped from 4.3m hectares to 4m hectares in recent years, which has raised concerns about the country’s long-term food security. “We are warning against diverting [rice] paddy land to other uses,” says Duong Ngoc Thi, a senior official at the institute. Of course increased investment in improved technology would help - a combine harvester operated by three people has the manpower equivalent of 100 farmers - but apart from finding the money to make this work, the techno-fix is not that simple since Vietnamese paddy fields are wet and muddy compared with the waterless fields which serve for other crops, and this makes it much harder for foreign-made, modern machines to work well in them. Nonetheless an increase in investment would undoubtedly help the Vietnamese rice industry avoid losing so much of its potential crop each year, according to Nguyen Van Chien, an official from the Vietnamese Ministry of Agriculture, and agricultural mechanisation could help enhance the quality as well as the quantity of Vietnamese rice, boosting the country’s competitiveness for rice exports with its chief rival, Thailand. At present, Vietnamese rice sells for around $20 less per tonne than Thai rice for quality reasons. Shouldn't There Be Plenty Of Workers In A Country Like Vietnam? 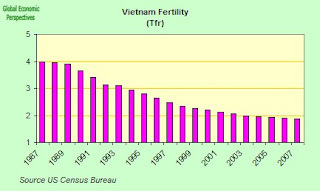 Of course, it is important to bear in mind that despite the recent dramatic drop in fertility Vietnam's population is still rising fast. This situation is a result of the so-called "momentum problem", since the last cohorts from the high fertility era are very numerous, and thus when they reach childbearing age will tend to produce a large number of children, even if the number each individual woman has is a lot less than previously. In addition we need to add-in the impact of increased life expectancy as rising living standards improve the general health of the population. So Vietnam's population is both increasing, and ageing rapidly, and this latter issue will undoubtedly have significant consequences later on. It isn't only in rural Vietnam, however, that labour shortages are now appearing. The Ho Chi Minh City Construction Association has forecast that this year the city will face a labour shortage in the construction industry since the number of building projects awaiting execution has doubled. In a recent report they noted that the shortage problem got significantly worse in the post-Tet holiday period, since (and in an example which follows a pattern we have already seen in China) many young workers did not return to their jobs after the holiday. Most construction companies have been busily raising wages in an attempt to entice more people yet the shortage persists. Nguyen Huu Quang, deputy director of the NBH Building Service Ltd. Co, is quoted as saying that construction companies in HCM City were in danger of losing a significant part of their human resources. As I mentioned, this failure of people to return after the Tet holiday is surprisingly reminiscent of the situation as reported in China after the end of the recent winter holdiday. The Economist - in an article entitled Where is Everybody - reported that the vast annual migration of around 20m people that has been fuelling the manufacturing boom in southern China over the past two decades is now rapidly diminishing. According to HCM association’s figures, construction companies in HCM City currently can supply more than 42,000 skilled masons, a number which is far below the real demand for workers, which is thought to be somewhere in the region of 100,000. In a trend which has been evident in other countries (like Eastern Europe) skilled construction worers have either transferred to other provinces (or gone abroad) or returned to their hometowns where better infrastructure now exists and a rapid rise in the construction of industrial parks and export processing zones is producing plenty of work. And what is the result of these growing labour shortages? As we have been seeing elsewhere (and again the East European comparison is instructive) the outcome is virtually inevitable: rapidly rising wages and accelerating inflation. These growing labour shortages, which can to some extent be anticipated in any economy which is growing rapidly, are exacerbated in Vietnam by the fact that many potential workers - in a way which is strangely reminiscent of the situation which is to be found in Poland or Romania - now work abroad, whether as temporary or permanent migrant labour. There is, however, one important difference between Vietnam and Eastern Europe in this regard in that Vietnam has an active policy of encouraging what they call "labour Export", indeed the Ministry of Labour has a whole department which is dedicated to the topic. The reason that this policy is persued is not hard to imagine. It is summed up in one single word: remittances. For 2006 the World Bank estimates that migrant workers sent home to Vietnam roughly $4.8 billion, or 7.5% of GDP. Of course such a sizeable flow of money has an impact in its own right on the Viet Nam economy, creating in its wake more consumer demand, and with this more demand for construction, and with this more demand for construction workers who, as a result of one of those many anomalous circularities we are able to identify here, happen all to be often to be working out of the country and are doubtless to be found among those actively sending money home. When you stop and think about it it isn't hard to see where all that inflation comes from here. As I say, it is not simply a question that people from Viet Nam want to go to work abroad, the Vienamese government is actively encouraging the process. As a result the number of foreign destinations has been expanding significantly. There are now more than 40 countries to which Viet Nam "exports" labour, compared with 15 in 1995. The Vietnamese labour market generated about 1.68 million new jobs in 2007 according to the Ministry of Labour, Invalids and Social Affairs. About 1.6 million of these new jobs were generated inside Viet Nam, but about 85,000 were jobs abroad, and these brought the total number of Vietnamese guest workers and experts officially working abroad to over 400,000 in 2007. And the Labour Ministry is working on further expanding the business, since it has plans to raise the rate of "exported labour" at an annual additional rate of 40,000 to 50,000 (to around 130,000 annually) by the time we get to 2010, an increase of 65 five per cent over a five-year period. Job seekers at a recent employment exhibition held in Ha Noi. Obviously given the wage differentials which exist people are eager to leave, but should the Viet Nam government be actively promoting the process? In the short term it eases pressure on the labour market, but at what price in the longer term? One destination which is proving increasingly popular is South Korea, and the Vietnamese Ministry of Labour recently proudly announced that Korean companies would like to recruit 15,000 Vietnamese guest workers in 2008, 27 per cent more than last year. In addition the Korean Government has decided to allow 1,000 migrant Vietnamese labourers who had originally registered for agriculture work to transfer to construction, which is itself suffering from a shortage of workers, according Vu Minh Xuyen, vice director of the External Labor Center of the Vietnamese Ministry of Labour. Xuyen said the workers will have to take an exam testing their understanding of the Korean language. The exam can be taken in May or October. Those living in remote areas and poor rural areas will be given priority. Workers seeking South Korea employment learn Korean at a job service centre in the Central Highlands in Gia Lai Province. Korean company demand for Vietnamese guest workers this year is 27 per cent up against last year. Of course South Korea is facing its own low fertility driven labour market issues. According to U.N. statistics, the fertility rate per women has fallen from 5.4 in 1995 to 1.5 in 2005 with the estimate for 2050 being 2.1. The population in the age group of 15-59 it is estimated to fall from 68.2 percent in 2000 to 50.4 percent in 2050, whereas the share of 60 plus population is to rise from 11 percent in 2000 to 33.4 percent in the same time span. Recent statistics show that South Korea's birth rate fell to its lowest (in 2005). The projected (Health-Welfare Ministry forecast) fall in population from the present level of 48 million to 40 million will occur over next 45 years. The ageing index (U.N. statistics) is projected to grow from 52.7 in 2000 to 150.7 in 2025. In a recent Korea National Statistical Office report, this index is forecast to reach 100.7 in 2016, almost doubling from 55.1 in July 2007, further projected to as high as 213.8 by 2030. 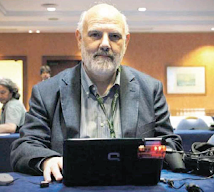 This will put a tremendous financial burden on the working-age population (those aged 15 to 64), to support those elderly citizens, while the ratio of the working-age population to senior citizens is predicted to drop to as low as 2.7 per one elderly by 2030, as compared to the present level of 7.3 to 1. So naturally Korea is going to increasingly need to import labour, and my only question is: does it make sense to import this labour from a country like Vietnam which itself is also going to be having problems over a fairly limited time horizon? The point is economic growth of the kind Vietnam would like to have is very employment intensive. At the end of 2007, there were more than 45.6 million Vietnamese employed nationwide, an increase of 2.31 per cent over 2006, and the Ministry of Labour plans to generate a further eight million new jobs by 2010. This objective was recently announced by Dam Huu Dac, deputy minister in the department, who said it was part of a National Target Programme on Job Generation. "Each year, 1.5 to 1.6 million new jobs are being generated and a total of 49.5 million workers are expected to be employed by 2010." he said. And this is just it, right now Vietnam has a massive problem of job creation quite simply because the number of people of working age has been expanding rapidly, but soon, following that sudden turn downwards in the 15 to 19 age group curve, the problem will be inverted, and having constructed an economiy which needs and extra 1.6 million workers a year to keep moving the issue will be one of just where those workers are going to come from? About 1.6 million seek to enter the Vietnamese labour market every year. Meanwhile, the nation’s population is growing by more than a million annually. The question I am asking is really one about our whole perception of the ongoing demographic transition. Does it really make sense for a country with such low fertility as Viet Nam now has, and where labour shortages in rural areas and key sectors like construction are already being observed, to be so enthusiastically exporting - in a way which is very reminiscent of Eastern Europe - its future labour force? As I say, the issue here is as much one of changing how we see the situation as anything else, and getting it across to those responsible for making economic policy that "cutting your nose of to spite your face" may work in the short term, but in the longer term we are only building up problems, and big ones. The story I am telling here is one of a web with many loose threads. And I wouldn't want to give the impression that I am arguing against labour mobility, far from it. I think that immigration from high fertility countries to lower fertility ones makes a lot of sense. What I am questioning is the movement of population from low fertility societies to higher fertility ones (from Poland and Latvia for example to the UK and Ireland, or from Ukraine to virtually anywere), and I am also questioning the advisability of countries which are attempting to grow rapidly while having falling and below replacement fertility actively encouraging and stimulating out-migration. At best this is simply moving the deckchairs round, and at worst it is robbing Peter to pay Paul when Peter is already out of money. The strangeness and lack of apparent rationality in all of this is perhaps nowhere better illustrated by the close and growing connection between the Czech and the Vietnamese labour markets. The Czech Republic's economy is growing rapidly - around 6% to 7% per annum -and unemployment is amongst the lowest in the European Union. As a result the Czech Republic is now itself growing very short of labour (only 3 years after watching a stream of its own young people leave for work in the UK and elsewhere), since after 20 years of very low fertility (1.2-1.3 TFR range) there are now fewer and fewer young people coming forward into the labour market, and so, of course, the Czech Republic is busy out and about looking for migrants to fill the gap. Initially they turned to their immediate neighbours, and indeed the largest group of foreign migrants with rights to work in the Czech Republic comes from Slovakia. At the end of last year, there were 101,233 Slovakians legally working in the country. Ukranians are the second most numerous group with 61,592 working in the Czech Republic as of last year. But there are problems here since both of these countries (and indeed all the other ones in the region) have very low fertility too, so they soon notice any drain on their labour resources, and this is then simply displaces a problem from one place to another and is not a long term solution. As a result the Czech government is now looking further afield - much further in fact - since the number of Mongolian and Vietnamese workers working in the Czech Republic has been increasing rapidly. In 2007 there were 6,897 Mongolians working legally in the CR (up from 2814 in 2006) and 5,4425 Vietnamese (up from 692 in 2006). The numbers of Vietnamese present in the country is undoubtedly much larger, and according to the Czech police, there are almost 51,000 Vietnamese holding long-term or permanent residence permits for the CR, many of these associated with temporary student visas. Demand from people inside Vietnam is also way up, and the Czech embassy in Hanoi had to close its doors to visa applicants temporarily in March to reorganise itself in order to cope with the influx. So you plug one gap to create another, and where I ask, is the method in all our madness here? In this post I have not presented solutions, rather I have attempted to identify problems, problems which need to be addressed. But in order to adequately start to address the problem we need first to recognise that it exits. Basically I feel that far too many people - and especially at the institutional level - are still effectively in denial that the problem exists, and is important. What I would like to ask is when is someone (someone with some clout I mean) finally going to start taking seriously the idea that emerging economy countries like Vietnam need to try and do something about their fertility situation (and that something will undoubtedly involve dedicating resources to the issue) before they get stuck - like South Korea, Singapore, Taiwan and Hong Kong before them - down on that very bottom rung? Vietnam’s central bank on raised its benchmark interest rates yesterday for the third time this year – to 14 per cent from 12 per cent – in an attempt to fight the soaring inflation problem. Inflation is rapidly eroding confidence in the local currency, the dong. As a consequence The bank also reduced the official dong exchange rate by 1.96 per cent against the US dollar from today, as a response to the fact that the street value is now falling rapidly. Finance minister Vu Van Ninh indicated recently that Vietnam is ready to raise interest rates further to bring inflation back below 10 per cent before the end of next year, from 25.2 per cent in May. Food accounts for almost 43 per cent of the consumer price index in Vietnam but Vu Van Ninh (who was speaking at a regional meeting of the World Economic Forum) said Vietnam was confident it now had sufficient supplies to avoid further price increases, as well as export 4.5m tonnes of rice this year. However, he said the rise in the oil price was “more of a problem”, although Vietnam would also benefit from higher revenues for its oil exports. My own view basically is that all of this is much too little far too late, and that the central structural problems (especially of skilled labour shortages) just are not being addressed. The country is experiencing ``short-term'' difficulty due to ``shortcomings'' in the economy, Ninh said. The government will need time to control inflation, which won't be an easy task; Vietnam's inflation is both ``domestically rooted'' and imported, he added. Vietnam's government operates fuel subsidies to provide a safety net and ensure "political stability,''. They have stated they don't plan to raise fuel costs this month and will take into account global crude prices when deciding on any increase in July, according to comments from Ninh. Vietnam may be forced to adjust oil and gasoline prices should global crude costs keep rising, Deputy Minister of Industry and Trade Nguyen Cam Tu said earlier this month. The government caps gasoline prices. Vietnam which is currently Southeast Asia's third-largest oil producer - trailing only Malaysia and Indonesia - has an average output of 360,000 barrels per day. Because Vietnam lacks refining capacity, at least until Dung Quat comes on line in early 2009, it is also one of the region's largest crude-oil exporters - perhaps the largest. Nonetheless Vietnam's trade deficit tripled in the first five months of the year to $14.42 billion from $4.25 billion in the same period a year earlier. Vietnam has temporarily suspended all gold imports in a bid to tackle the spiralling trade deficit and help support the depreciating local currency, the dong. Vietnamese investors have been rushing into gold as a hedge against skyrocketing inflation, Hanoi – which sets an annual quota for gold imports – has withdrawn licences for further imports, traders said on Monday. The decision comes as record imports of gold bars have made Vietnam the world’s biggest market for gold bullion, surpassing India and China and helping to deepen Vietnam’s trade deficit. The state-controlled Lao Dong newspaper reported this week that the trade deficit for the first half of the year had tripled to nearly $17bn, up from $5.2bn in the same period of 2007. 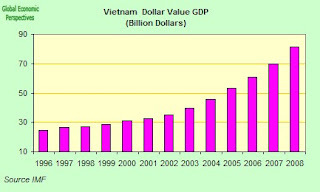 Vietnam’s trade deficit for the whole of 2007 was $12.4bn. The popularity of the gold in Vietnam has also surged as its price jumped, reaching a record high of $1,030.80 a troy ounce earlier this year. It was trading yesterday at just below $900 an ounce. Gold prices have averaged $910 an ounce this year, against $659 in the same period of last year. According to the industry-backed World Gold Council, Vietnam’s first-quarter gold imports were 36.8 tonnes, up 71 per cent from the first-quarter of last year. Of that, 31.5 tonnes were gold bars – or so-called investment gold – up 110 per cent over the same period last year. Vietnamese market insiders are saying that the value of the country’s gold imports for the year – prior to the suspension – had hit $1.7bn, for 45 tonnes, compared to total gold imports of $1.6bn, for 70 tonnes, in 2007. Vietnam ceded to market pressure to allow further weakening in its currency yesterday by doubling the trading band for the dong against the dollar. The State Bank of Vietnam, which has already devalued the dong by 2 per cent earlier this month, said it would widen the daily trading range to 2 per cent from Friday. The move comes as Vietnam clocks up its eighth successive month of double-digit inflation. Consumer prices in June were 26.8 per cent up on the same month a year earlier, driven by a 75 per cent rise in food prices. The estimated trade deficit for the first half of 2008 nearly tripled to $14.8bn, adding to pressure on the dong.